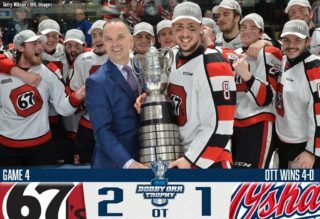 Philadelphia Flyers prospect Morgan Frost finished one goal short of a single game franchise record, netting five goals as the Soo Greyhounds defeated the Sudbury Wolves 7-4 on the road. The career-high for Frost helped the Greyhounds earn their sixth straight win and 30th in the regular season standings as they continue to sit atop the West Division. Frost, who sits third in OHL scoring with 75 points (30-45–75) over 38 games, is on a six-game point streak and helped the Greyhounds go 3-0 on their weekend road trip. The 19-year-old from Aurora, Ont. is in the midst of his fourth OHL season. He was Philadelphia’s first round pick in 2017 and recently represented Canada at the 2019 IIHF World Junior Hockey Championship. 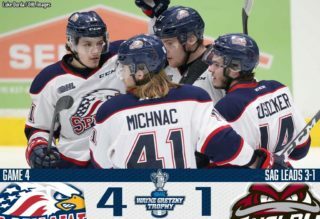 Oshawa Generals overage forward Anthony Salinitri continued his torrid pace, netting his fourth hat-trick of the season as the Gens doubled-up visiting Flint 8-4. Salinitri’s four hat-tricks have all come since he joined the Generals in late November, giving him 59 points (34-25–59) over 45 games between Oshawa and Sarnia this season. The 20-year-old Windsor, Ont. native also added an assist on Sunday to give him four points on the game. 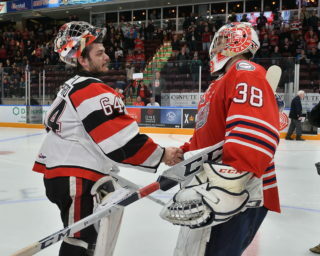 He has points in eight of his last nine games and has helped Oshawa win five straight contests. Salinitri was a former sixth round pick of the Philadelphia Flyers in 2016. He attended rookie camp with the Vancouver Canucks back in September. 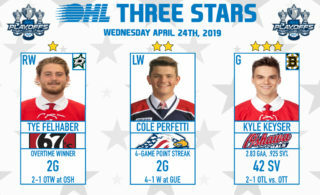 Kitchener Rangers forward Greg Meireles connected for his first OHL hat-trick as the Rangers defeated the division rival Owen Sound Attack 5-3 on home ice. The 20-year-old from Ottawa, Ont. scored 7:03 into action and added two more goals in the third as the Blueshirts pulled to within five points of Owen Sound in the Midwest Division. The former first round pick in the 2015 OHL Priority Selection has 54 points (21-33–54) over 44 games this season including points in each of his six contests.